These were written in addition to the haiku I wrote for the daily haiku challenge. I came across the art and then imagined myself at a New Year's Eve party at the end of 2016. 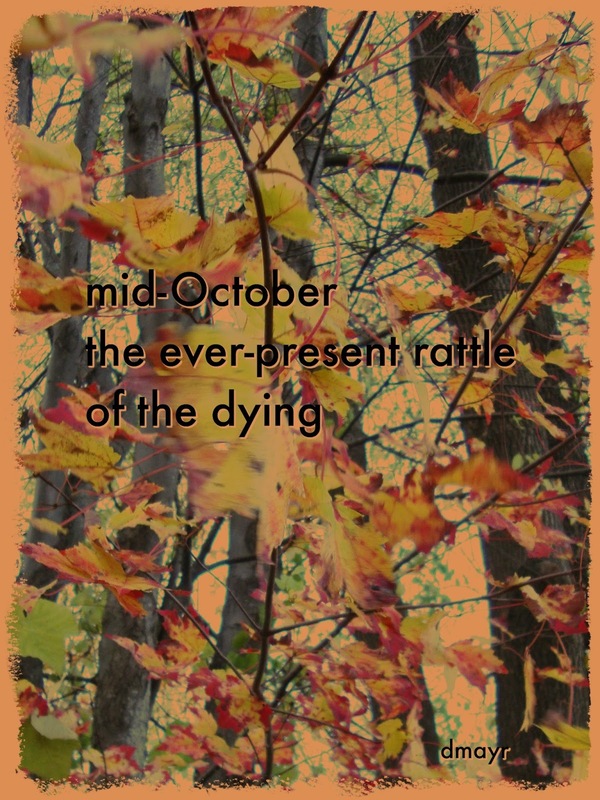 I decided a series of haiku/senryu would work best. I'm not sure, though, if they could stand alone without the picture. 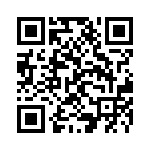 Click on the image to enlarge. © Diane Mayr, all rights reserved. "Where Angels Play" by Louise Abbéma (1878). on that cup of kindness?" 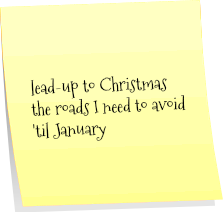 Head north a wee bit and you'll arrive at Mainely Write where you'll find the last Round-Up of 2016. Have a safe and happy New Year! 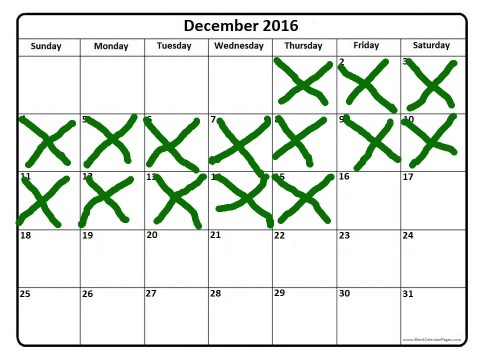 We're winding down to the end of December and the end of a year that will long be remembered (by me at least) as the year from hell (with the major exception of the birth of Owen). 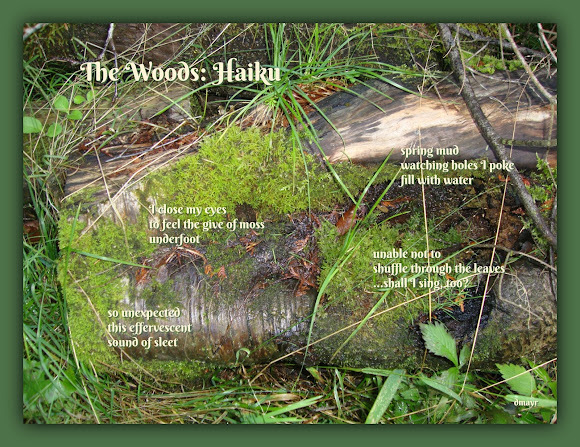 Here are the haiku written within the last week. I will add the last two days of the month's haiku by Saturday. 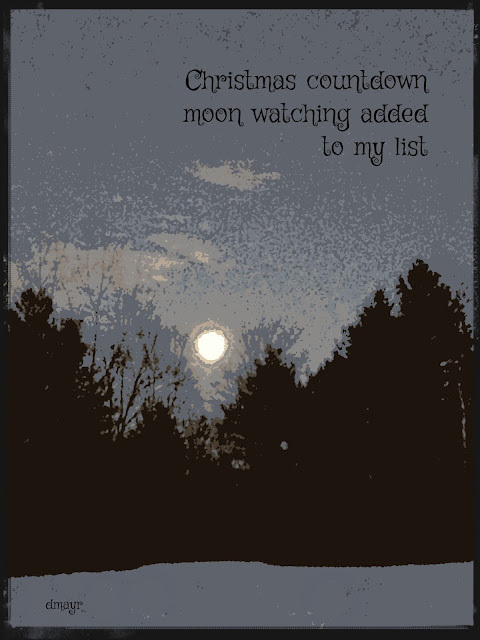 This haiku I wrote to use for my Christmas Day haiga. 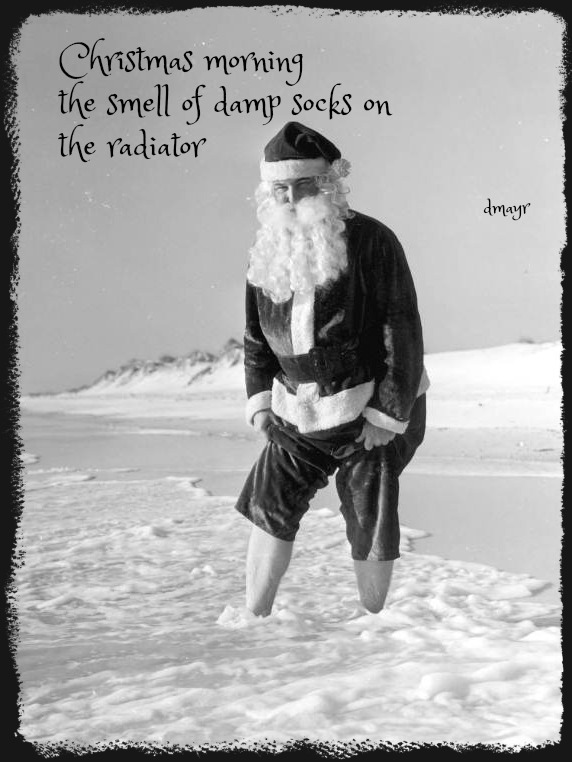 I actually found this photo by Francis P. Johnson first, then wrote the haiku to fit. Here's wishing you all a 2017 full of haiku hope and happiness, justice and peace. 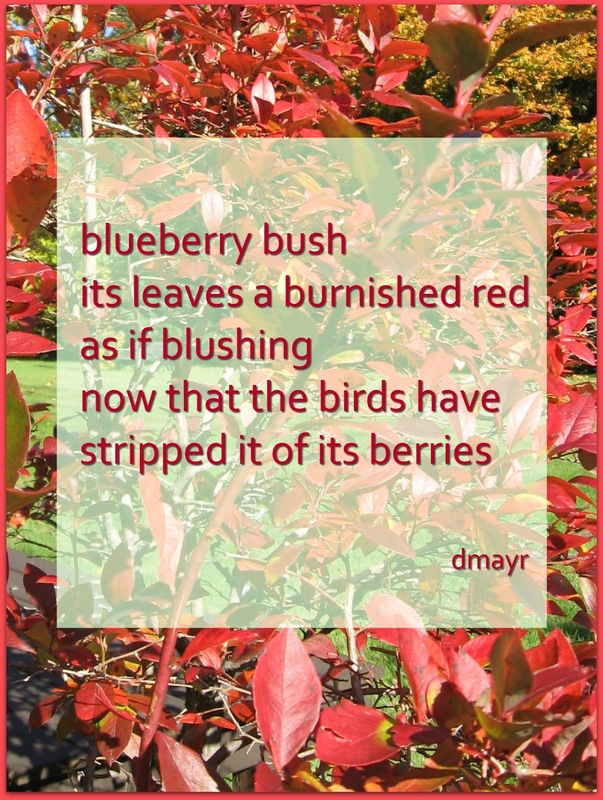 © Diane Mayr, all rights reserved. Photo by Francis P. Johnson. I've been in a blue funk since November 9, without hope of breaking through. 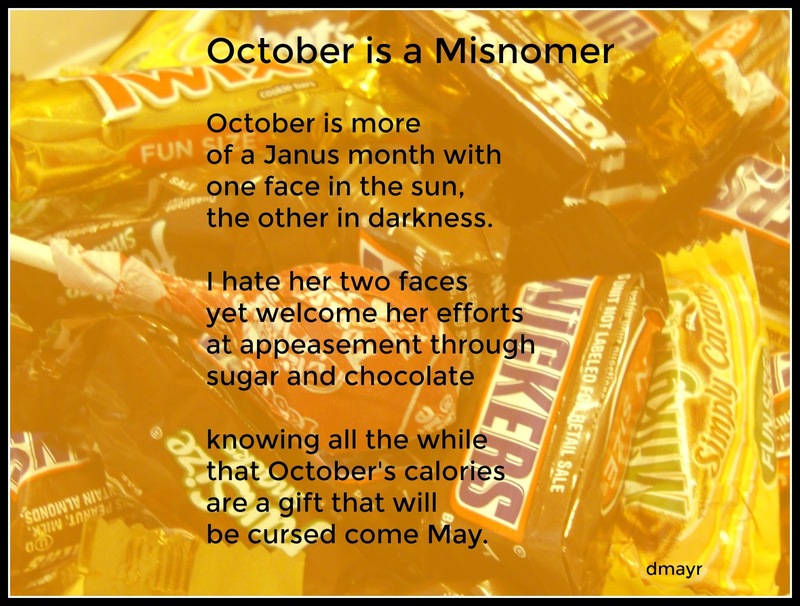 So, for this holiday Poetry Friday I've decided to post something from a poet who is not me! Yes, indeed, there are Christmas miracles. 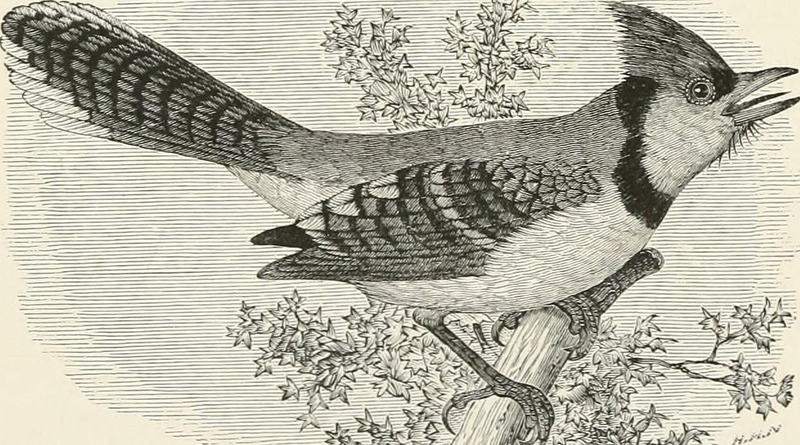 I wrote about Robert Francis back in October and shared two of his bird poems. 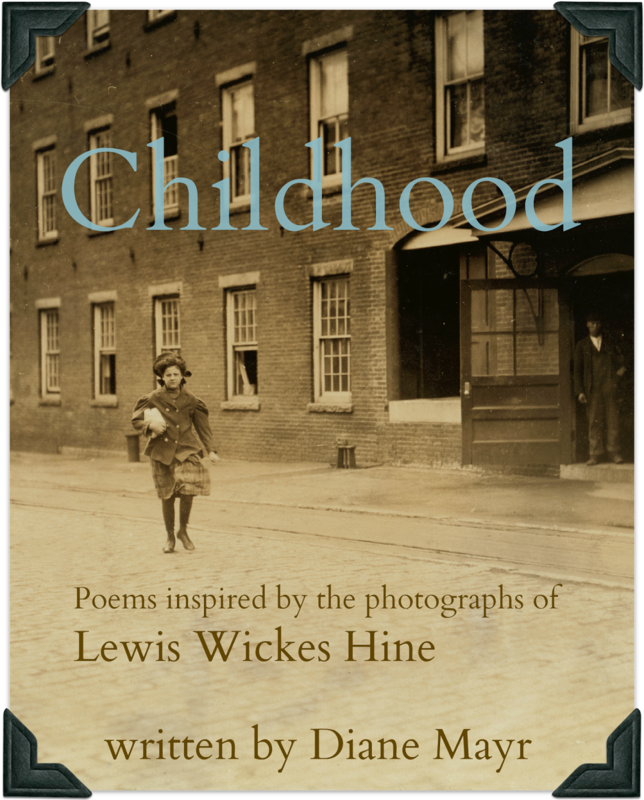 Since that time, I've borrowed several other small volumes of the work of this New England poet. Illustration from A Year with the Birds (1917) by Alice Eliza Ball and R. Bruce Horsfall (1917). A sort of Florida of our best blizzards. As well as roadside sumac, red-plus-seeded. All weather-proofed and feather-fluffed on snow. 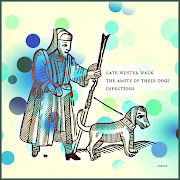 Hard fare, full feast, I'll say, deep cold, high spirits. Here's Christmas to Candlemas on a bunting's budget. Cracked corn, cracked wheat, peanuts and split peas, hail! disparagingly or approvingly, of the well-made poem. but grow--like snowflakes, like flowers, like seashells? like a goddess, like a diamond--is not made but born? Fly over to Buffy's Blog for this week's Poetry Friday Round-Up! Happy holidays! 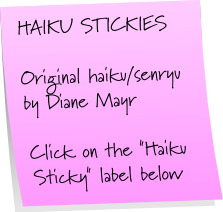 Seven more haiku to add to the #haikuforhealing challenge posed by Mary Lee Hahn. © Diane Mayr, all rights reserved. 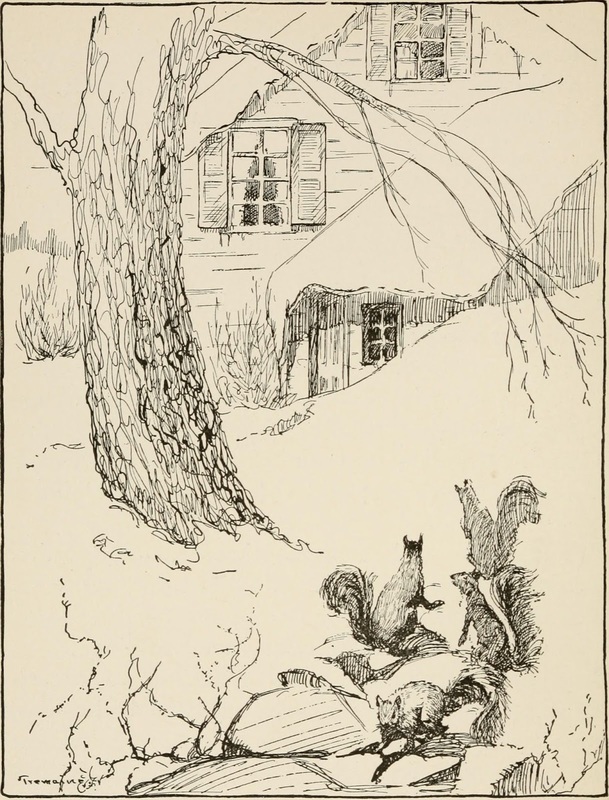 Illustration from Uncle Zeb and His Friends by Edward W. Frentz (1919). 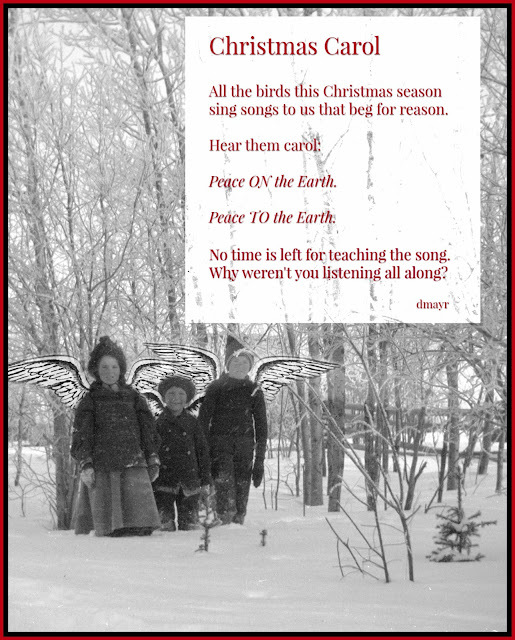 This started out as a sad commentary on what global warming has done to bird populations. It lightened up considerably through various versions, but it still is a bit too didactic. sing songs to us that beg for reason. No time is left for teaching the song. Why weren't you listening all along? 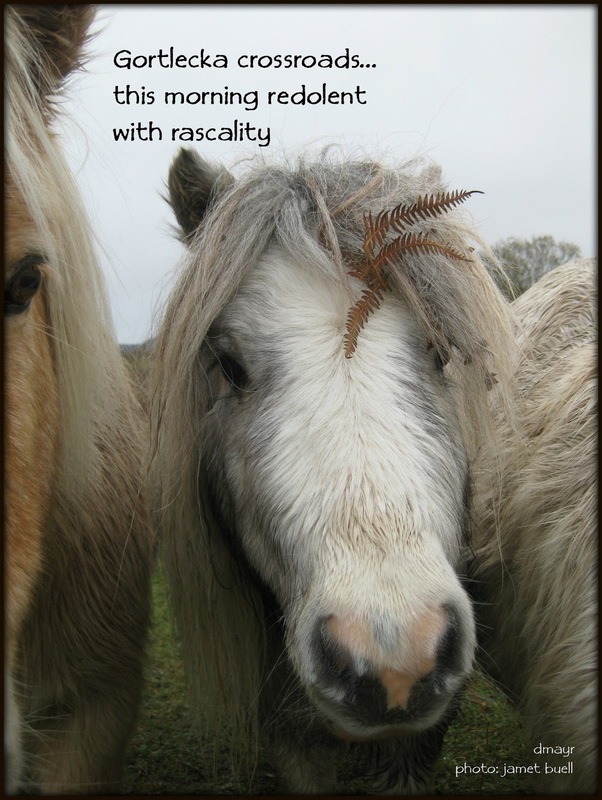 Tabatha at The Opposite of Indifference is hosting the Round-Up this week! 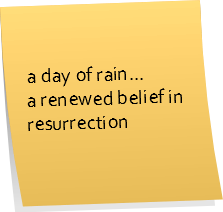 It's the end of the second week, and here are the haiku I've written since last Thursday's post. It's always a question I have, if we're in the middle of a drought is it worth it to use water to clean out a plastic recyclable container or, is it less of an environmental impact to throw it unwashed into the trash? Anyone want to weigh in on this? 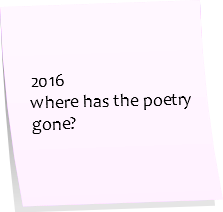 Here is a haiku from December 2009, which, I find oddly appropriate for 2016. I took an already dark painting by John Twachtman and edited out most of the color. © Diane Mayr, all rights reserved. "An Early Winter" by John Twachtman (circa 1882), courtesy The Athenaeum. Head west to visit fellow librarian, Jone, at Check It Out. 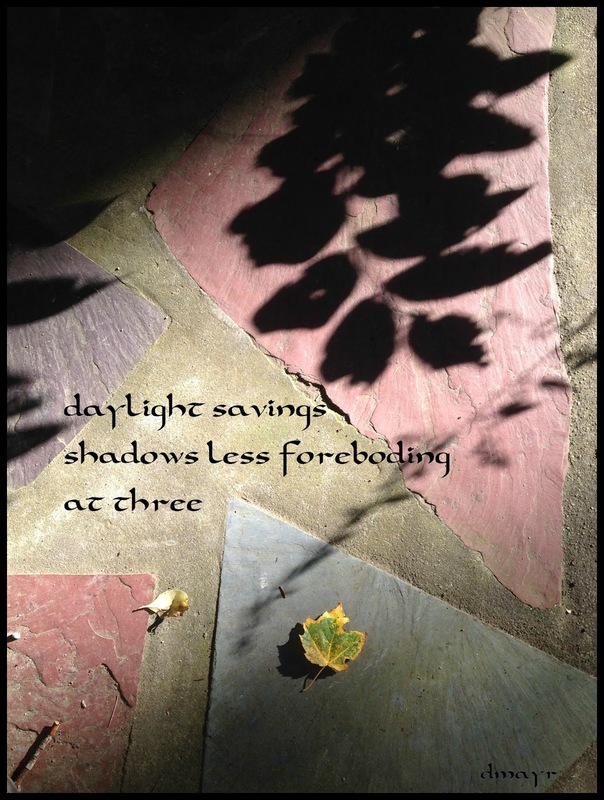 This is yesterday's haiku written as part of Mary Lee Hahn's Haiku-a-Day in December challenge. 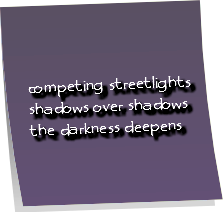 On Thursday, I'll post a full week's worth of challenge haiku. 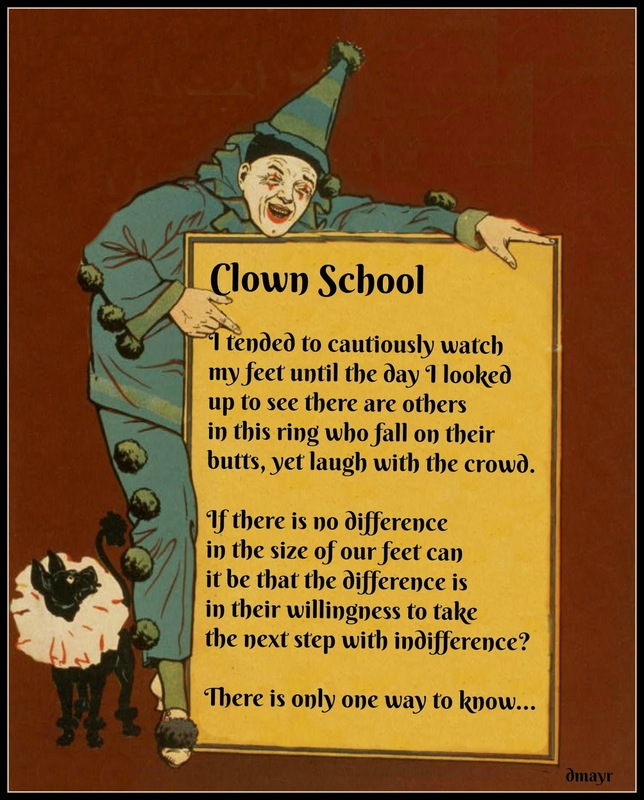 Soon to be led by a master clown, we all need a few lessons in how to survive. © Diane Mayr, all rights reserved. Vaudeville poster courtesy Library of Congress, edited. butts, yet laugh with the crowd. the next step with indifference? Visit Wee Words for Wee Ones for more poetry in the Round-Up. ©, Diane Mayr, all rights reserved. Trying to work my way through the election--still... A poem for today (possibly more hopeful than I feel). © Diane Mayr, all rights reserved. 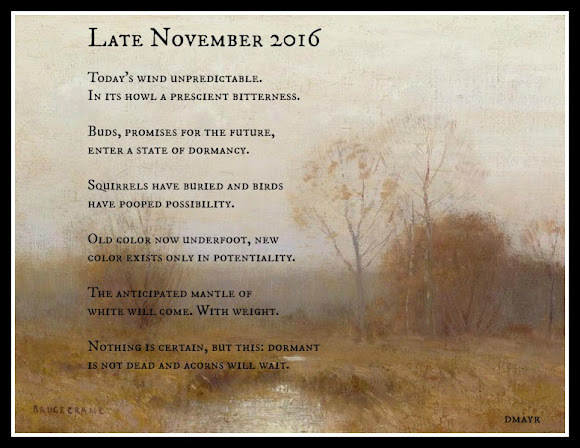 "Grey November" by Bruce Crane, courtesy The Athenaeum. In its howl a prescient bitterness. 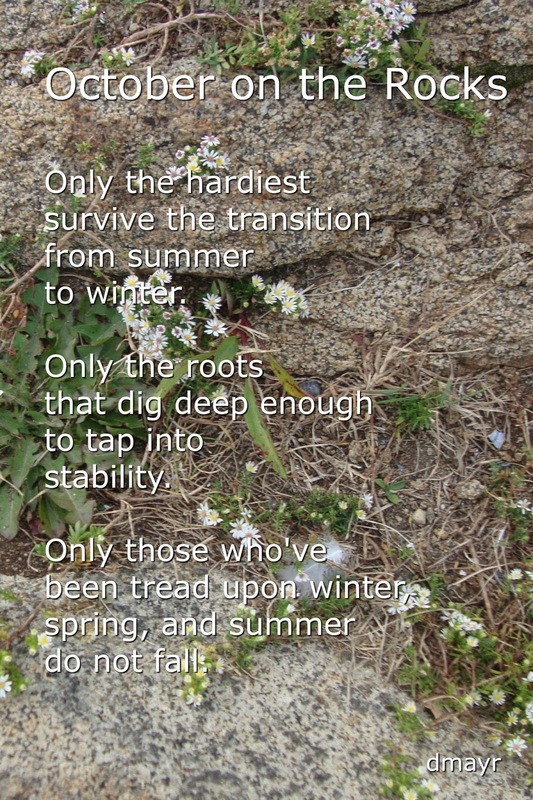 enter a state of dormancy. color exists only in potentiality. white will come. With weight. 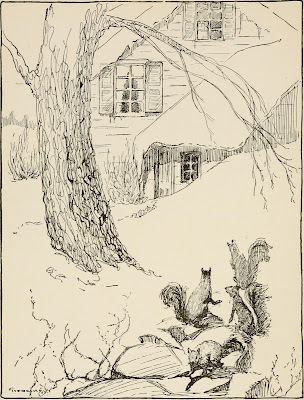 is not dead and acorns will wait. 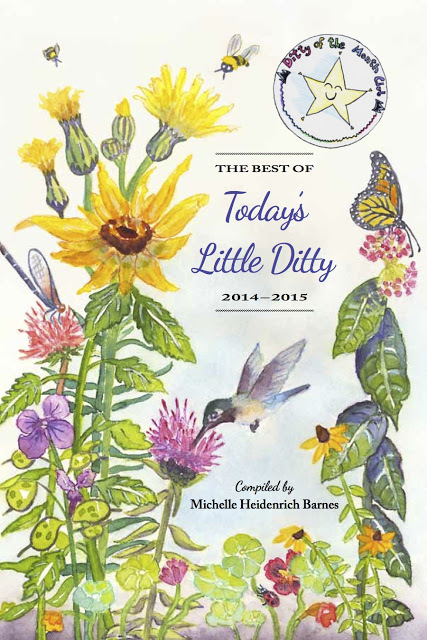 Last Friday, Michelle Barnes announced the publication of her The Best of Today's Little Ditty anthology. Think Christmas, or any holiday or gift-giving occasion--it would make a great stocking stuffer! Also with her announcement, Michelle held a "Five for Friday" ditty writing exercise. 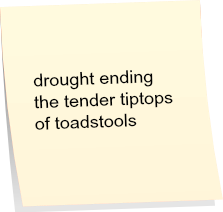 We were instructed to write a five word poem (plus title) about "the best thing that happened to you this week." 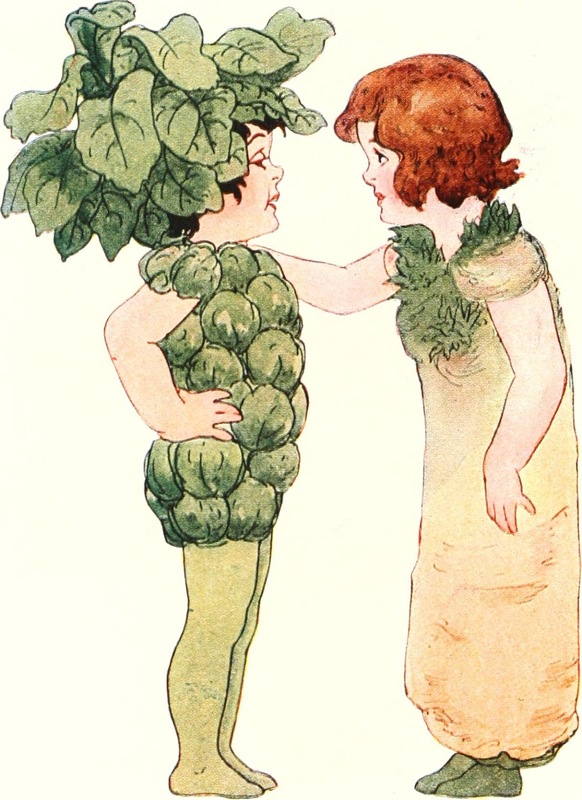 Illustration from Mother Earth's Children: The Frolics of the Fruits and Vegetables by Elizabeth Gordon . You may be thinking, "But what about the Brussels sprouts?" The best thing that happened to me early last week was that I roasted a pan of Brussels sprouts. I had marinated them in olive oil vinaigrette and roasted them at 375 degrees until nicely browned. They were delicious. I thought about them for days after. I checked through my files and found that I've written about Brussels sprouts before! The tanka came about as a result of my first success with roasting sprouts. I never did make roast beef. Spending big bucks on a roast beef and then risking overcooking it didn't appeal to me. I no longer have an appetite for roast beef, so I will probably finish my life without ever making one! Can you write a five word poem about Brussels sprouts? If you're up to the challenge, leave your entry in the comments below. If you're not up for a challenge, do you have a favorite Brussels sprouts poem? 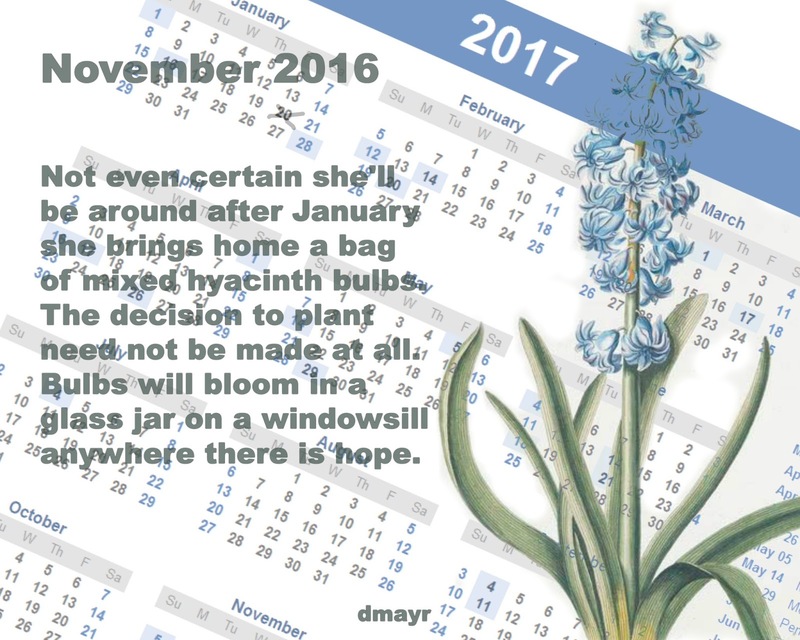 Do you know of any Brussels sprouts poem? I'm curious as to how many we can come up with! Quite a few, as it turns out! There seems to be a Brussels sprouts affinity among Poetry Friday participants! Visit Carol's Corner for the day-after-Thanksgiving (also known as Gluttony Remorse Day) Poetry Friday Round-Up. Thanks to my friend, Janet, now a resident of Ireland, for the photo! Photo © Janet Buell, used with permission. 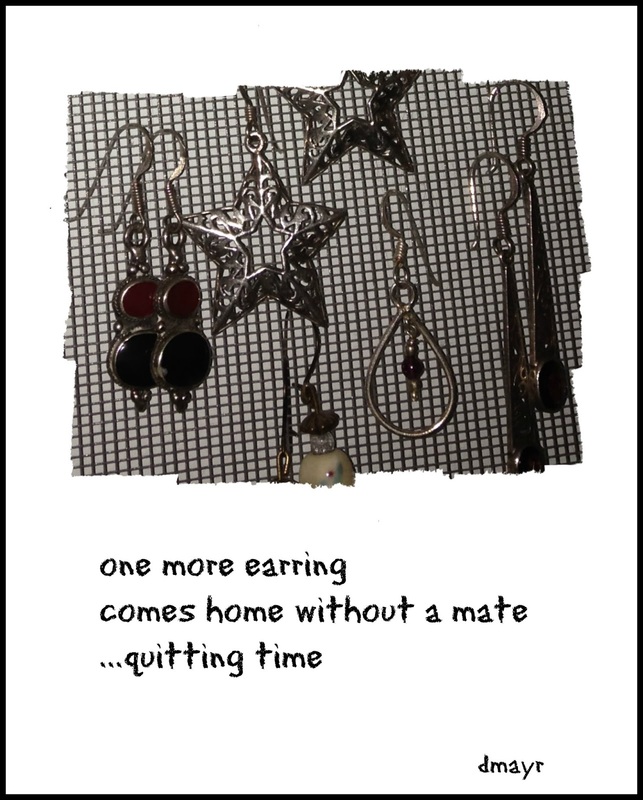 Haiku ©, Diane Mayr, all rights reserved. 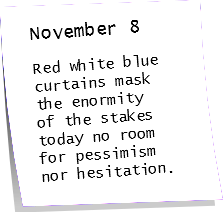 A few days before November 8, I was full of hope about the presidential election. I was also almost giddy at the idea of finally devoting my time to reading something other than political articles. Then November 9 came and I quickly came to realize that I am obligated to continue with my reading. It's depressing and so exhausting. 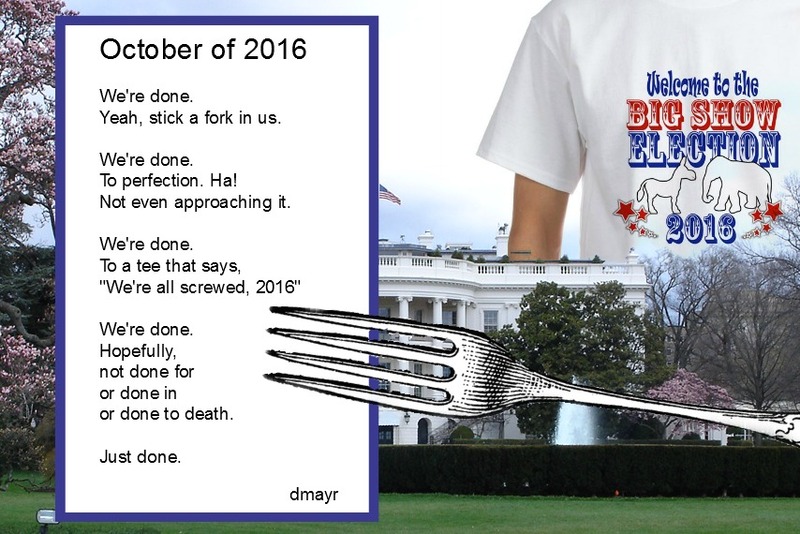 I'm tempted to leave everything behind, since, the effects of the next four years may not be undone in my lifetime. But, where to go? Brenda at Friendly Fairy Tales is waiting for you to stop by for the Round-Up! She also made me aware that screen readers for the visually impaired cannot "read" the text within a jpg, so, I will have to remember from here on in to also include the text. need not be made at all. And, if you're looking for something to do with the kids this weekend, Run, Turkey, Run! : The Musical is being performed at 10 AM Saturday and Sunday at the Seacoast Repertory Theatre in Portsmouth, NH. 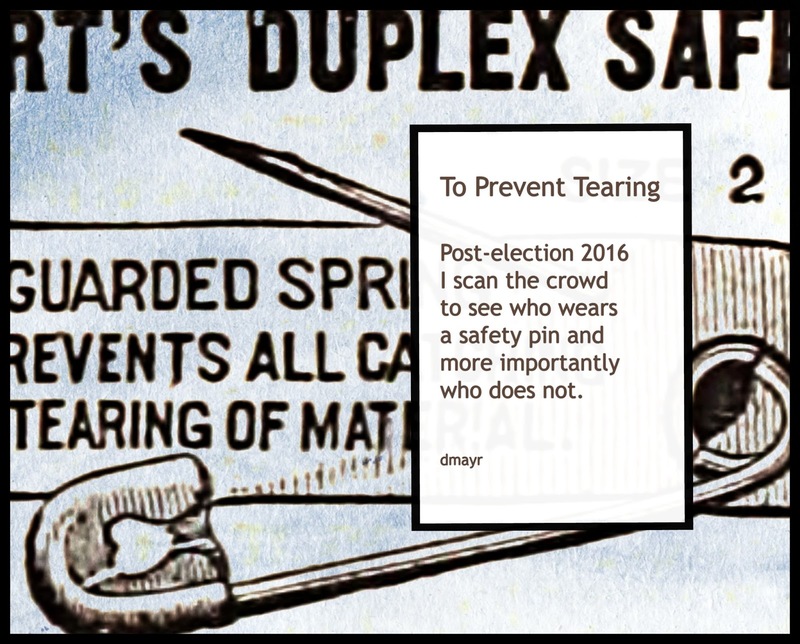 If you haven't been on social media in the last few days, you may have missed the safety pin movement. It seems that a large number of incidents have occurred since November 9 that leave many feeling fearful, so, if you are ever in a situation where you fear for your safety or someone is making you uncomfortable, look around for a person wearing a safety pin. By wearing a safety pin that person has agreed to stand by you or anyone else in need of a friend. 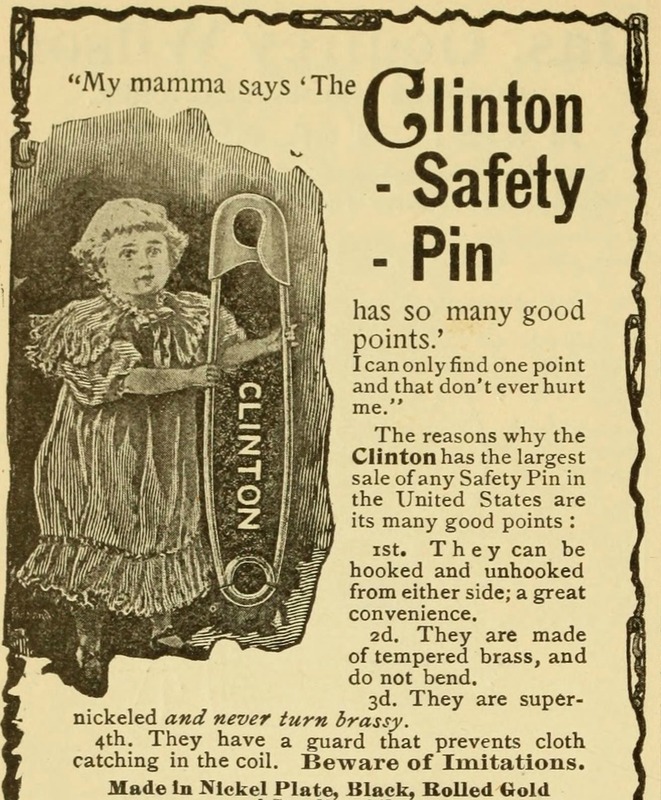 In looking for an image of a safety pin, I also found the ad below. I decided not to use it with the poem because I think it's interesting to read in its entirety. I find it strangely ironic. and spilled them in the street against the curb. When I read these lines I remembered the bushel baskets that were standard in everyone's garage in the 1950s. Some may have known them as peach baskets, but they were used for carrying apples, corn, and all sorts of other things. Where I grew up on Long Island, NY, they were used for clams or crabs. And, of course, for moving raked leaves to the burn pile. 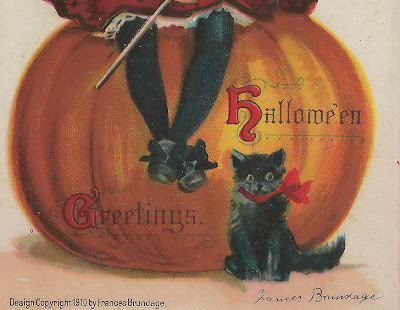 Of course, when I wrote the comment last week, the election was still foremost in my mind, but, I also got to thinking about other ways to describe ugly black plastic bags full of leaves and thus embarked on a fun afternoon of similes. The first one is obvious. Does anyone know about the second one? Babci (pronounced Bop-chee) is grandmother in Polish. Kiszka (pronounced keesh-ka) is a Polish blood sausage (something I never would touch, but that my father loved--I shudder to remember the look and smell of it). After four similes, I ran out of ideas. Metaphors didn't seem right at all for plastic trash bags. That's an exercise for another time and another topic. 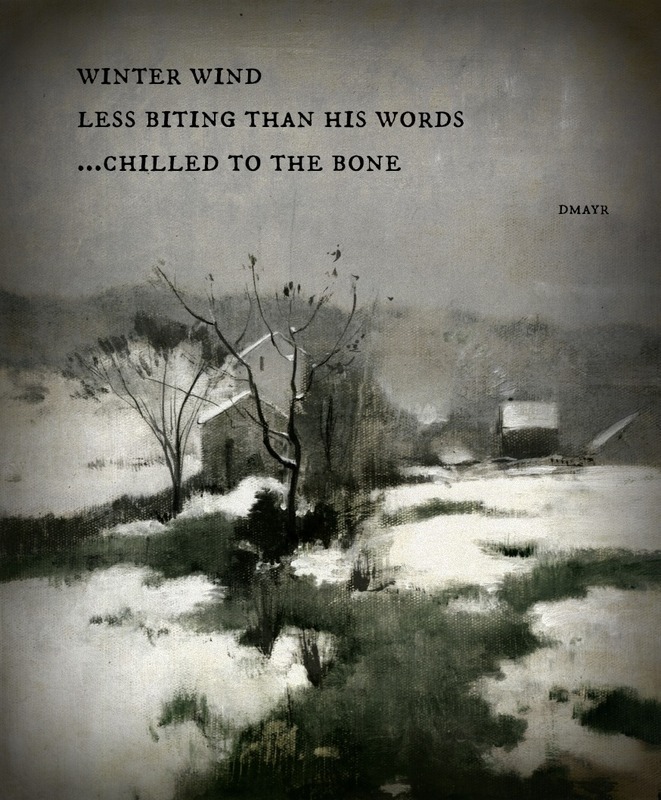 Neither similes nor metaphors appear in my poems, for the most part, I'm a haiku person after all. In haiku a trash bag is a trash bag. Period. Jama is the Poetry Friday Round-Up host this week, so I'll meet you at Jama's Alphabet Soup. 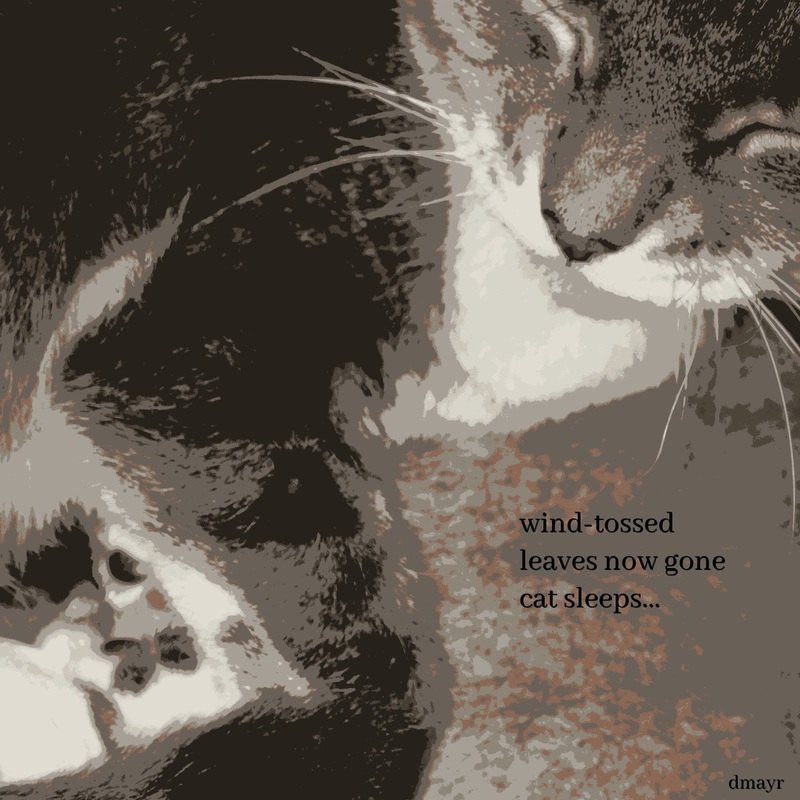 No haiku for today! 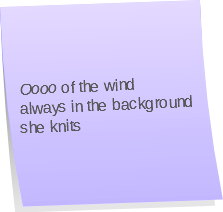 How about a poetic note? Amy Souza, the originator of the Spark: art from writing: writing from art exchange, also holds a postcard exchange between the Spark challenges. October was my third time participating. For my postcard, I illustrate a haiku or small poem that I write for each person in my group of exchangees. There were only three people in my group this time so I only needed to create 3 art postcards. In April I used a bird theme, in July I used "endless summer heat." This time I made it even easier on myself by making my theme simply October. 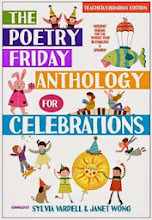 Head over to Writing the World for Kids where Laura is hosting the Poetry Friday Round-Up. © Diane Mayr, all rights reserved. The tee-shirt in the middle image is found at CafePress. The only good thing to come from one of this year's presidential candidates is the way he opened up a discussion about sexual harassment and assault. The New York Times ran an article last week, "She Never Spoke of It to Her Husband. Then She Heard the Trump Tape," about how women and men are now speaking up, and out. A problem exists and now is the time to give a boot to the monster hiding under our beds, or in our attics, closets, and basements. One of the men interviewed for the article said, "A lot of the time you have to have someone push you in that direction or plant the seed to get you talking." So, Poetry Friday readers, consider this the seed. You don't have to reveal your secrets here, I'm not asking for that. Humiliation, even after dozens of years, may still hold you back. I encourage you however, to tell your story on paper (or electronic device of choice). 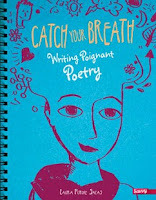 Write a poem and say, "Enough!" 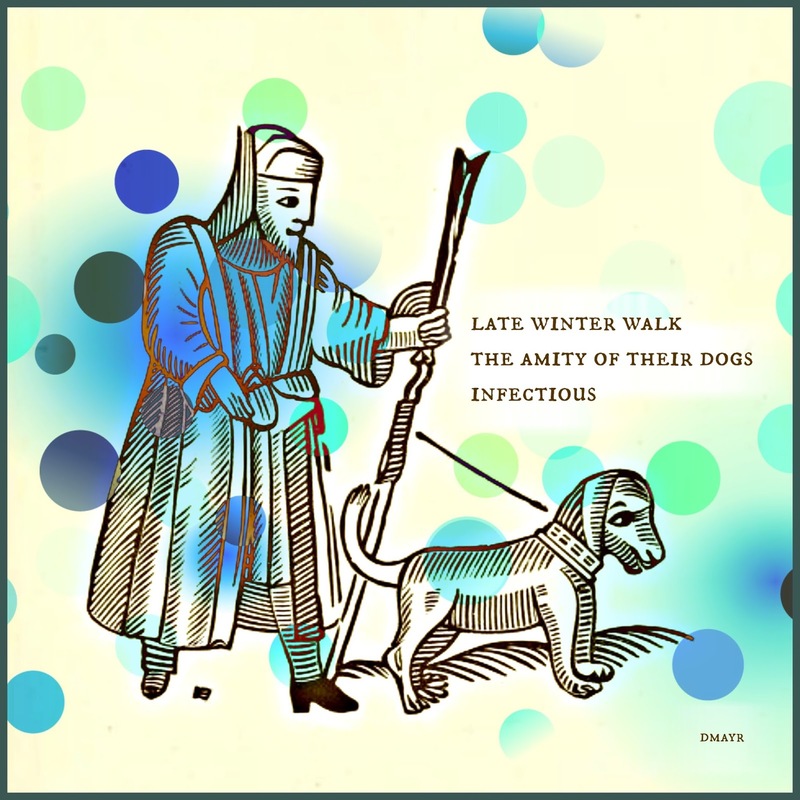 Back in 2011 I had the pleasure of being featured in one of Jama Rattigan's series of "Potluck Poets." 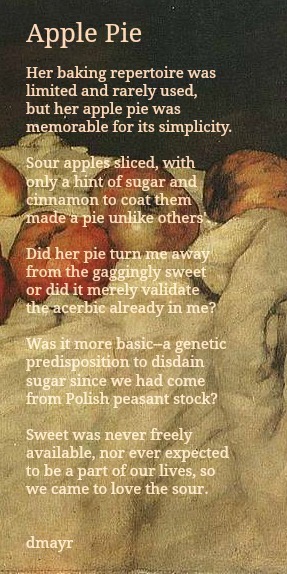 I shared a recipe for almond bars, a few haiga, and for some reason (probably because I had looked through my high school yearbook), I included a poem that had been sparked by a memory of what happened to me in high school in the 1960s. Yes, we hang on to some memories for much too long. I told Jama, I could still remember the feel of the hand that grabbed, at a most delicate area of my body, from under the bleachers. decades than you’d care to admit. 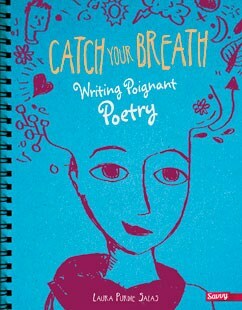 have a poem? Oh, I bet it’s there. to jump out and yell "Surprise!" 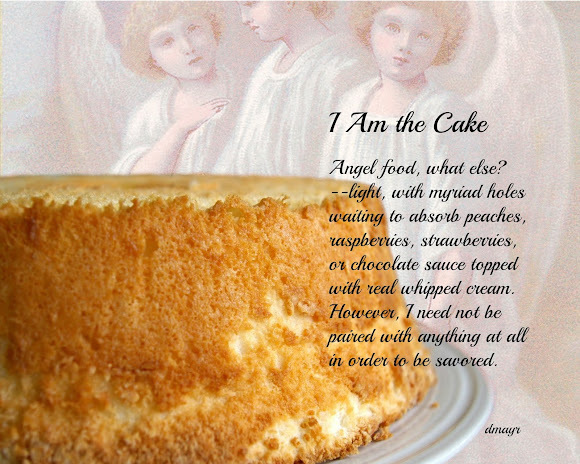 Think of yourself as the cake. 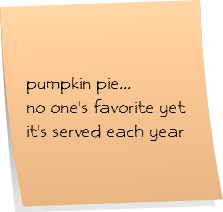 Okay, Cupcake, it's up to you to tell your story. And, if you live in the U. S., it is up to you to vote on November 8! Peace and justice shall prevail! Please visit Linda at Teacher Dance for the weekly Poetry Friday Round-Up. ¨ Diane Mayr, all rights reserved. This assignment was an impossibility to complete since my mother has been dead for the last 31 years. 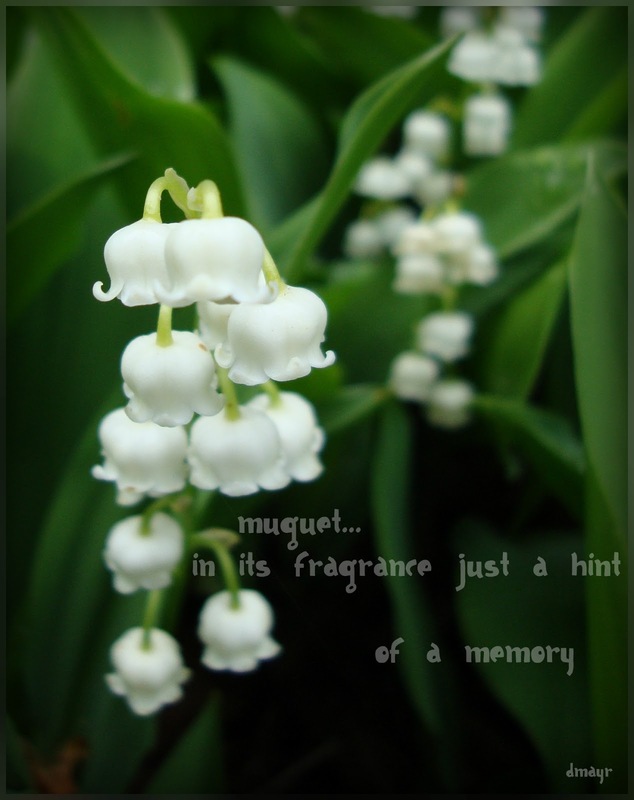 My mother died at the age of 57, much too early. Unfortunately, I have lived with the idea that my mother would not have died if she had taken care of herself. Why does a woman let herself be diminished by her appetite? I have a few theories in my mother's case--low self-esteem, unfulfilled dreams of a career, buying into the idea that a woman's only role is to be a wife and a mother. Of course, there could many more reasons, some of which would never have been revealed to me no matter how long she lived. There are some things one keeps to one's self. I guess Michelle did not get as many responses as she had hoped for earlier in the month, because, the other day she posted something (which, now, I can't find to quote accurately) asking those who've held out to please consider writing a short poem. 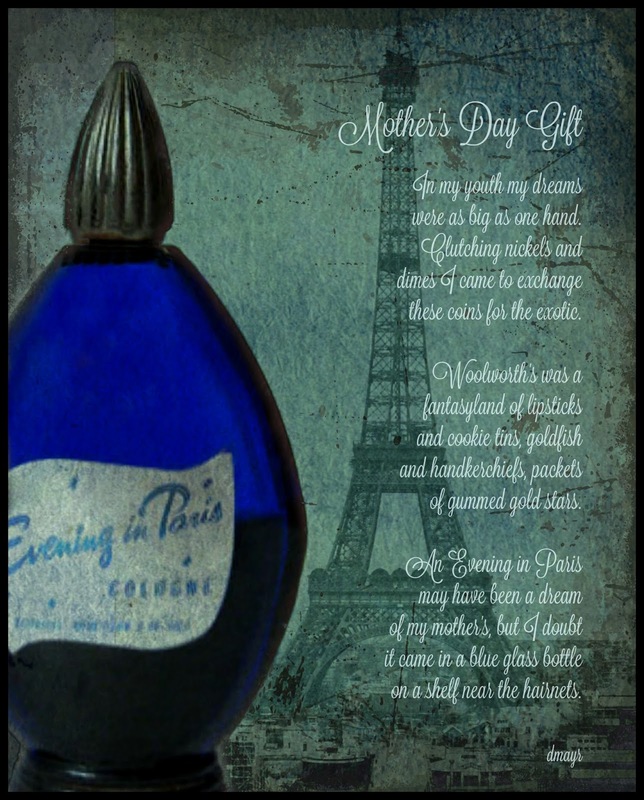 If the issues we all seem to have with our mothers are overwhelming, and have held us back in their expression, perhaps something shorter would be doable. 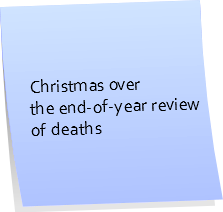 So, I've taken that advice and written something short. 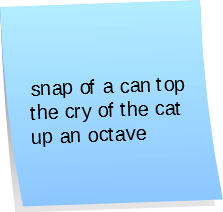 It is posted on the October 2016 padlet. 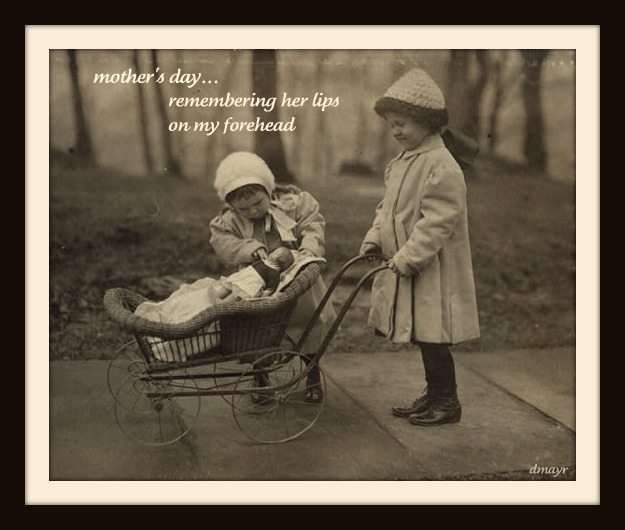 And for today, I've gathered a few haiga that I wrote about my mother. They've all been posted here before. 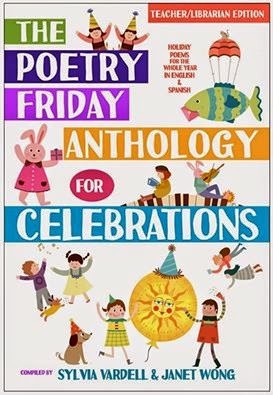 The Poetry Friday Round-Up is taking place today at The Miss Rumphius Effect. Stop by! After a year and a half of drought conditions, we had a day of intermittent rain. The next day I was amazed at the number of little white puffballs that had appeared overnight in my yard. If you're a regular reader here, you may have picked up on the fact that I love birds (and ironically, cats). 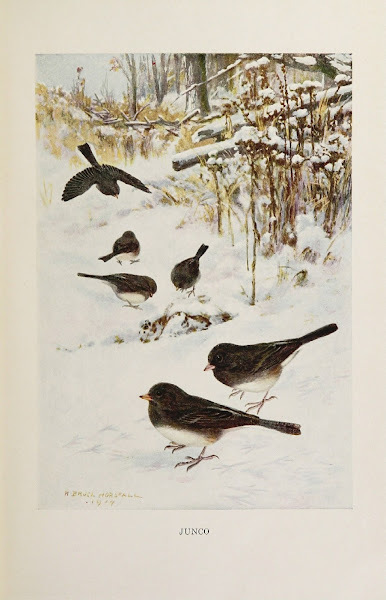 I have two bird poems from Robert Francis. Robert Frost once said Francis was "the best neglected poet." Consider him now un-neglected since we're talking about his work today! Child's toy that slips a reel? But beyond who is why. whose every arrival is a raid. nor him who loved less gentle. If you're interested, I've posted Robert Francis poems twice before, here and here. 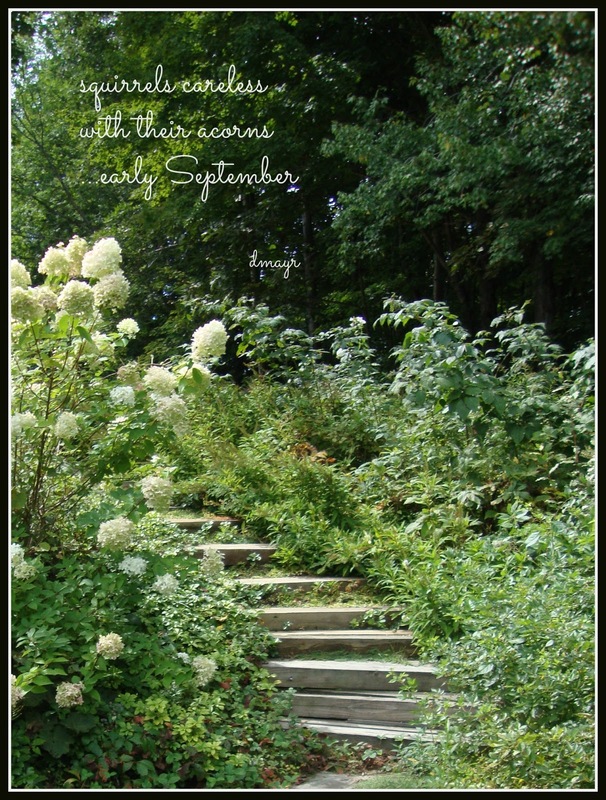 Please check out the poetry happenings being rounded-up by Irene at Live Your Poem. This year a number of people on Facebook shared a a Columbus cartoon from The Oatmeal. I urge you to take a look at it and read it, including the notes at the end. It explains a connection to American history that most of us probably haven't heard--Columbus's role in the slave trade. It is not a pretty picture. 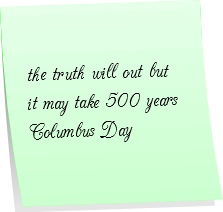 I'll never think of Columbus Day in the same way. The artist who put together the Columbus Day cartoon offers up some alternative titles for the October federal holiday. I'd like to offer this one, "Truth and Justice Day." Recently I've been reading two new adult books of fiction that take a look at slavery. They are The Underground Railroad by Colson Whitehead and Homegoing by Yaa Gyasi. Of the two, Homegoing had a greater impact on me. I highly recommend it for book group discussions. Although The Underground Railroad is an "Oprah book," and on the list of finalists for National Book Awards, I can't recommend it with the same level of enthusiasm, but, it, too, will make for a great discussion. 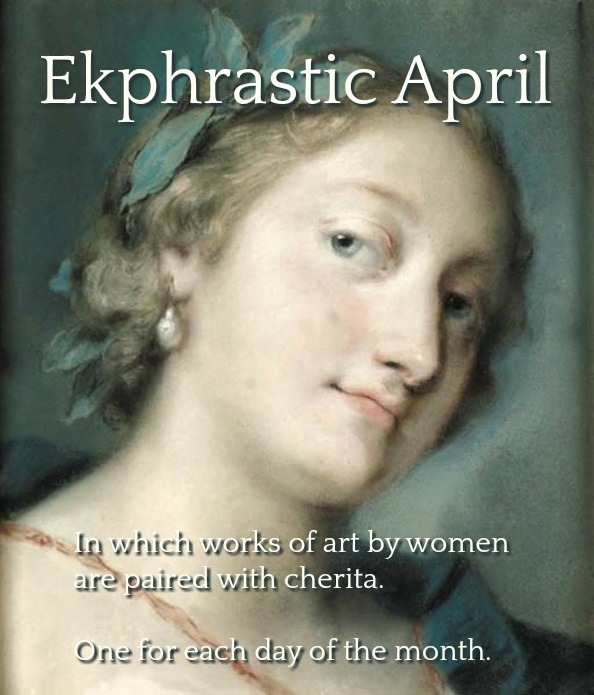 An ekphrastic ditty for today! 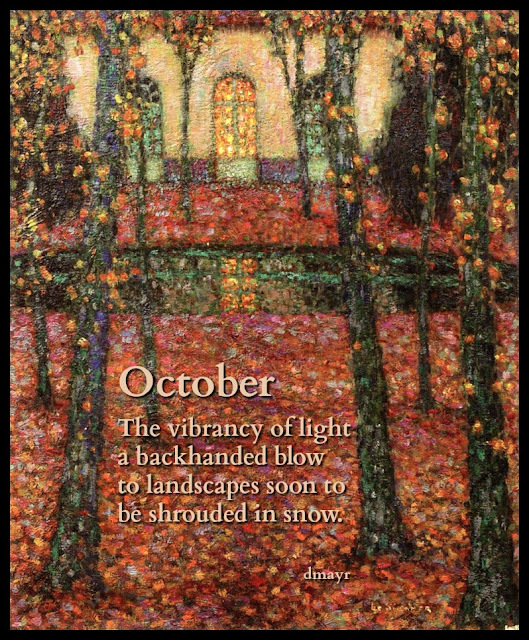 "Bassin de Trianon à l'Automne" by Henri Le Sidaner, courtesy The Athenaeum. The significance of this presidential election occupies my thoughts much too much. Writing poems doesn't seem to be an option at this time. One month to go before the anxiety either subsides completely or begins to grow exponentially. Until then, I'm digging through old poems to fill the void. This tanka was written on October 3, 2010 and I used it for today with a photo I had taken back in 2009. 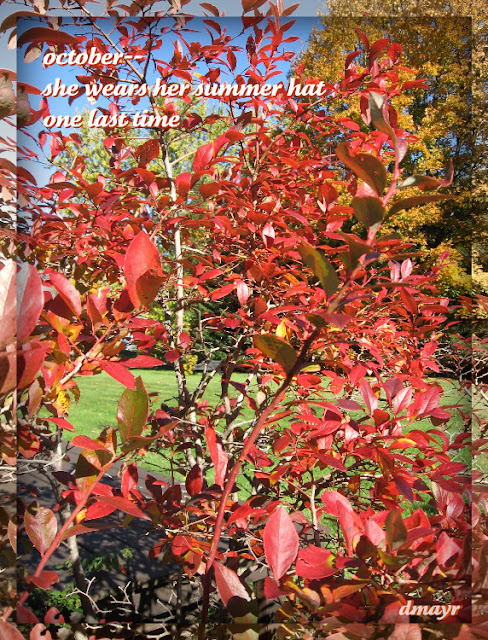 My blueberry bush was particularly colorful that year. 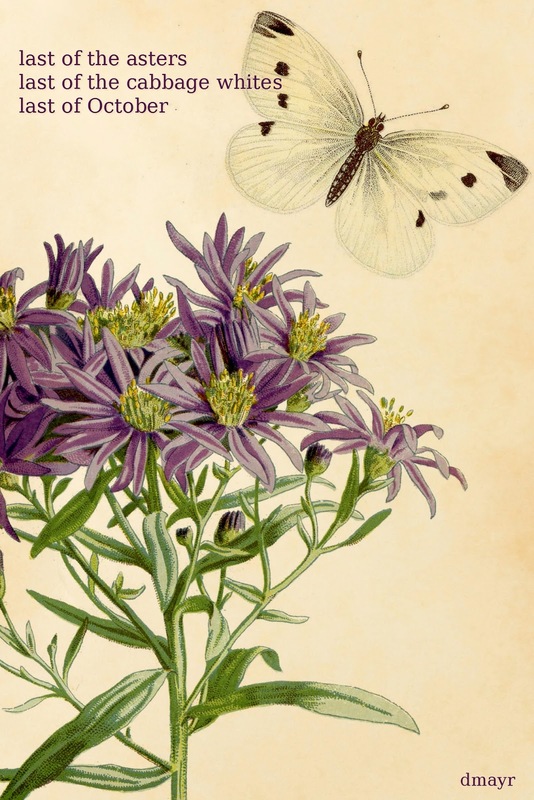 For the Poetry Friday Round-Up you must visit Violet Nesdoly / poems, she's waiting for you! Have a great weekend! September is already gone, so I figured I'd better post this one before the winter is here and the squirrels will be looking for those acorns they left behind on the stairs!